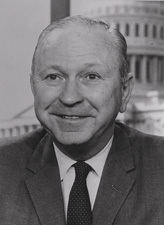 James Caleb Boggs (May 15, 1909 - March 26, 1993) was a Republican U.S. Senator from Delaware. He also served as a governor and a Congressman. He was defeated in 1972 by future Vice President of the United States, Joe Biden. This page was last changed on 18 November 2017, at 13:06.